STRI Gauges - Miata Turbo Forum - Boost cars, acquire cats. Not sure who has heard of STRI gauges, but they make some very high end gauges, similar to Defi, but much more affordable. I have these gauges in stock, DSD and X-Line Series. They come in 52mm or 60mm, and in Clear Lens and Smoked Lens, Black/White Dials, with White LED or Amber LED lighting. They have Boost, Water Temp, Oil Temp, Oil Pressure, Fuel Pressure, EGT, Tach, Volt, Intake Pressure, and a 3bar Boost..
Can you get them in *F and PSI or is it only *C and kg/cm2 as shown? Actually, we ordered almost exclusively imperial, or as I like to call them... American. So, yes. are the oil pressure and temp sensors diaphragm or transducer type? Are there any problems whatsoever with the oil sensors failing? What is the daylight visibility like? Smoked lenses? Very good, although may be a little difficult with the top down..
Not sure, I can find out. I do know that master distributor has only had to replace like 4 gauges in the last year, so I would say the quality is there. Not aware of any plans at this point. Sorry. can't you just switch out the bulb for a green light bulb/led? they are LED's, I would assume they are soldered to the circuit board. Should be an easy swap for anyone inclined. I just sent a guy selling under radio gauge panels a question regarding the size of the gauges that will fit to give you an appropriate answer about the final sizes on those gauges. Water temp and oil temp ^^^? Electric Boost and Oil Temp? 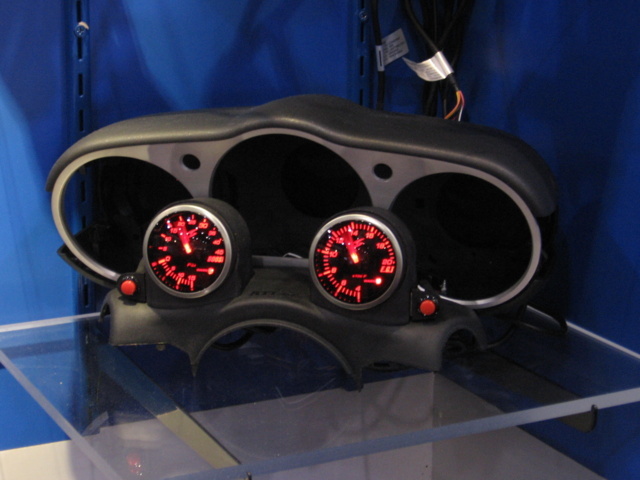 Well, I was all excited about ProSport gauges, but unfortunately I am reading complaints about accuracy and longevity. The STRI DSD ClubSports have caught my eye. The price is reasonable and the literature really seems to spotlight build quality and accuracy. I've not read a single bad thing about them on various forums either. My only nit-pick is that you-tube videos of these non-smoked gauges make the backlighting look obnoxious and the pointer burns as bright as the Hindenburg. This might be due to the same backlighting being used for both smoked and non-smoked gauges, just a guess. I'm sure bad camera work contributes as well. Nester, have you had a chance to play with the ClubSports? The manual is not yet available on STRI's site. How does the dimming feature work? Does it rely on the vehicles dimmer or does it auto-dim to a preset level when you turn the lights on? If auto-dim, is it user selectable or factory preset, etc. Is it possible to disable all that silly needle dancing when they first get power? Nope, part of the self-check/calibration.. plus it's cool.